Hummingbirds are tiny birds. It only makes sense that their nests are equally tiny, custom-built to raise the itsy eggs into new hummingbirds. 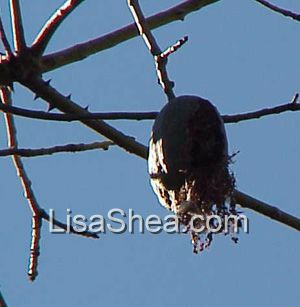 Here are hanging fruits that I saw in Los Angeles on a trip out there. The hummingbirds waited until they were dried and then drilled into them to build their nests. I saw several hummingbirds flying in and out of this tree to their homes. When a hummingbird builds a more traditional "nest" out of ferns and tiny twigs, it literally could fit into the palm of your hand. Hummingbirds build these nests out of ferns, moss, lichen, straw, and other delicate materials. They even use spiderwebs to "glue" the nest together! You can't really put out birdhouses for hummingbirds. They want to build a tiny, safe nest in a bush or shrub around 10' tall. Be sure to have lots of shrubs around for them! The males take off once they are done impregnating the female, and then it's her job to raise the young. The females will lay their few eggs, maybe just two, that are the size of peas. Then in around 3 weeks they'll hatch their inch-long babies. In another 3 weeks or so, those tiny new birds will be zipping around on their own!